Tuning Drum | What can YOU Use to Create Drums? Tuning drum things - Music from Junk? Search for more Calgary music. By tuning drum and idiophone instruments (one where the entire instrument vibrates in the production of sound), you can get a percussion-based orchestra. See, for instance, the Steel Drum Pans of Calgary. Like the ones used by Calysto SteelBand, one of the most peculiar Calgary bands you can find anywhere. 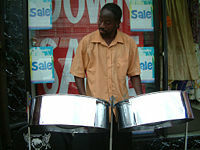 A musical steel drum is a portion of an industrial steel drum, most commonly used as an oil barrel. The container is modified by an intense process of heating, cooling and shaping to retain physical characteristics such as absolute tuning and tonal sustain. The drum is able to produce a number of identifiable tones, depending on where it is struck. This gives performers the ability to play the resulting instruments melodically and also in harmony with each other. The original object, combined with this tuning process provides a very unique and percussive sound. Some individual pans produce well over twenty different distinct notes, however they are tuned to the standard western chromatic tuning system, equally tempered so that pieces can be performed in any key. Overall, the different components of the orchestra give a range of about five octaves when combined. You get full bass, mid-range and treble capabilities. How are they constructed? For a more technical description, read here. You can hear various musical textures created by advanced striking and strumming techniques. A solid rhythm section comprised of a drum set and several Caribbean music and Latin percussion players playing conga, tambourine and so forth backs up the orchestra. They add rhythmic elements and delicious effects. When combined with expert musical arranging provided by original founder Ann Jamieson and others, this variety from our beloved Calysto steelband results in a full musical palate to enrich the experience of any listener, casual or expert. You have probably heard the music of steelbands in films and television shows countless times, and so may be familiar with the sound. You like steel drum band music? Have you ever seen one of these bands live? It's a lot of fun. See one if you get a chance. Let us know if you did see a steelband, and if you enjoyed it. Great! Click the button and find it on your computer. Then select it. Go back from Tuning Drum to the Steel Drum Pans web page or visit the Calgary City Maps homepage.